Dan Jackman, a mechanic at Mosaic Community Bike Shop. Petra Crinklaw's hands are tar-black from the bike grease, and her gaze is fixated on a BMX bike wheel, its axle clamped into a vice grip. "Shhh. Don't judge me," whispers Crinklaw, who uses a pair of pliers for the especially tricky task of adjusting the bearings, small metal balls inside the wheel that allow it to glide forward. "I'm going to do this." Months ago when Mosaic Community Bike Shop opened up in a vacant parking lot and Crinklaw saw all of their bikes, she wandered in and kept coming back. "I spent an entire summer teaching myself everything I know [about bikes] without asking any questions," says Crinklaw, who now has help at the shop. "I hate them; but I love them. I hate the fact that they never want to work, and when you put the pieces back together and you have extra pieces." The shop is essentially the successor to Pedals2People, a lower South Hill nonprofit that sought to encourage bicycling by selling inexpensive refurbished bicycles and teaching people how to make repairs before closing its doors in 2014, says Doug Porter, Mosaic's manager. The shop, which opened downtown last September in a shuttered rental car office on Second Avenue, has a similar mission. It rents out repair stands for $10 an hour and sells bikes for prices ranging from $30 to $600, which helps Mosaic cover its costs, says Porter. Levi Corker, left, chats with Petra Crinklaw as they work. Both came across the shop by accident and have been coming back to volunteer ever since. But Mosaic has more of a social component, says Porter. People in Community Court can complete their required volunteer hours by working in the shop. And Porter hopes that the shop will serve as a way for people to learn new skills that'll help them land jobs, like the junior from Ferris High School who is getting credit for working in the shop. 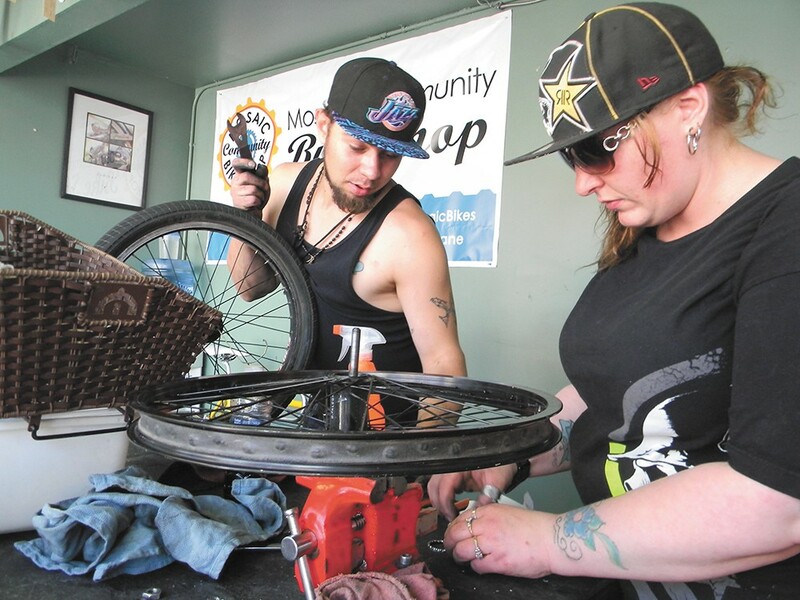 The shop was also started by Mosaic Fellowship Spokane, a nondenominational church that purchased all of Pedals2People's frames, wheels, handlebars and other various bike parts that are stored in a warehouse. Porter says that the church started the shop as a way to interact with people downtown "without being churchy" while filling a niche for the city's cycling community. "If nonprofit bike shops didn't exist, there'd be no place to get used parts or learn to work on your own bike," says Jason Spade, the shop's volunteer business manager. "Because most of the high-end bike shops don't do that." Dan Jackman says he's always been a tinkerer. In the back room of Mosaic, he's tinkering on an "old, stiff and dirty" bike that someone brought in for a tune-up. As he carefully threads a cable through the bike's derailleur, he says that he used to work as a millwright, repairing and maintaining machinery at construction sites. His back problems limit his employment options, and he was working as a night security guard when he one day struck up a conversation with Porter and Spade. "For better or for worse, I'm good at sticking my two cents in," recalls Jackman, who made some suggestions on how to organize the shop. They listened, and hired him to fix up bikes and show other people how to work on theirs. "Sometimes we get people who come in who just want to talk," says Jackman. Sometimes, he says, people who walk in are having a hard time and are losing faith in themselves and others and just want a sympathetic ear. Morgan Schmidt, Mosaic's public relations manager, says that although the shop is connected to a church, proselytizing and judging aren't priorities. "The bike shop is a place where it meets people where they're at," she says. "If you make $60,000 a year or $60 a week, you are welcome there." Porter says that before the shop opened up, it was a big vacant parking lot in a crime-ridden area. Now, he says, people feel ownership over the shop and the block. He says a volunteer sweeps every day, and the two bikes that have been stolen were swiftly found and returned by volunteers. "It's not just a bike shop," he says. "We're trying to reclaim people's lives; we're trying to make an impact on this area of downtown." While Crinklaw continues working on the wheel, she banters with Levi Corker about his facial hair. His fingers are tattooed with letters spelling "Hillyard" and are obscured by black bike grease. "He thinks he's so funny with his Abraham Lincoln beard," says Crinklaw. "Hey, it took a long time to get this, OK?" he replies. "Four score and seven years ago?" she asks. "Maybe twice that," he responds. Crinklaw says she appreciates how Porter doesn't "force the whole church thing on anyone." Working on bikes at the shop, she says, provides her with a sense of satisfaction, seeing something that she built. Eventually, the shop plans to start offering a bike mechanic certification course that Crinklaw says she'll enroll in.